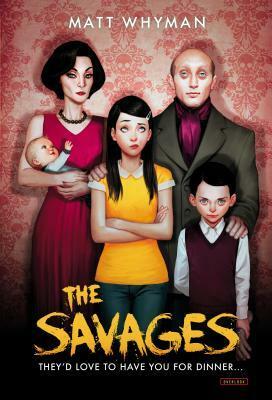 The Savages are not your every day family. Dad has an illegal business going, Mom has major credit card debt, their son is quite odd, and their oldest child is dating a vegetarian. Oh, and every once in a while they like indulge in some cannibalism. This book sounds like it could be super dark and creepy and horrific, but it isn't. 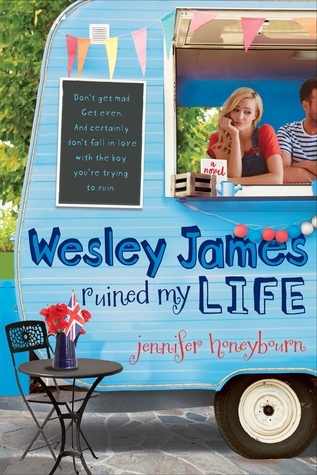 And, I think, with the cover (which I REALLY LIKE), it suggests a fun, satire sort of novel. Which it sort of isn't. Instead, The Savages is actually a much deeper novel. It's more about family, acceptance, and being who you are...with some wit and oddities mixed in, of course. I was very much looking forward to reading this book (Hello, CANNIBALS! How many books have a family like that?! ), but very soon upon starting I found myself irritated with the book. (Maybe I just wasn't in the mood for this book.) Right after that first chapter, though, that feeling suddenly lifted, and the book was better. I don't really have any complaints about The Savages, or anything that really bothered me. I liked it okay, but I just didn't find it lovable. It was missing a wow factor. BUT, there was something about this book that was pretty likable. Something to get used to in this book is the POVs. There are a LOT of them. (Though it kind of worked, and I'm not really complaining.) But when you're in a person's head, you're not just in THEIR head...third person omniscient, I believe? I haven't read much from that POV, so it was...interesting. And while some of the POVs sounded similar, each still had its own touch to bring that character to life. The writing, while a bit different, wasn't too bad. Though I have to note that the author lives in Europe or something, so instead of quotation marks there are apostrophes. And some of the terminology isn't American, too. Also, there's no Oxford comma. I LOVE the Oxford comma, and it drives me crazy when it isn't used. So, just a note! In the end, I think the most interesting thing about a book about a family of cannibals (though they don't like that word) is that, more than it being gory or comedic, it's actually pretty deep. That said, does that mean that The Savages is dark and depressing book? No. It has lots of light moments and simplicity, and it really is just interesting and unique and kind of fun. Despite how some of this review may sound, I enjoyed reading this book. And with that unexpected, interesting (I know, I'm saying that a lot) ending, we'll see what happens in the next book (I think it will be lighter and more fun). Would I reread it? Probably not. Would I purchase it? Maybe...I DO like that cover. Who would I recommend it to? People looking for something different, and a mix of depth, a bit of creepiness, and some wit. This book sounds awesome! I like that it seems like it was totally different than what you were thinking going into it. It sounds like a really odd and strange winner to me! Glad that you enjoyed it, even if it wasn't your favorite! I love the cover of this book SO much but I'm not sure if I want to read it yet. Think I'll go look it up on Goodreads!